2008 has been a long year for me and due to several factors, I entered the second last week of the year without having even stepped into a theatre, despite a long list of movies I would have liked to see. Thanks to a friend, that changed and we went out to a theatre on Boxing Day to see the latest Tom Cruise movie, Valkyrie. We're both very interested in history, WWII, and war movies, so this seemed like it would be right up our alley. And we were right - this was an excellent movie and I hope more people go out to see it over it's theatrical run. Based on true events, this is the story of Colonel Claus von Stauffenberg and his role and leadership in a revolt within the Nazi regime in an attempt to assassinate Hitler. 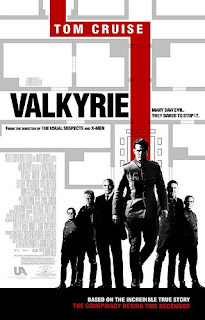 The movie is directed by Brian Singer, with Cruise in the role of Stauffenberg, and veteran actors Kenneth Branagh, Bill Nighy, Tom Wilkenson, and Terrance Stamp all providing excellent performances. Singer and Cruise have talked about how they set out to make a thriller based in this genre / time period vs a standard historical epic and it shows. They and the script writers were meticulous in going through available records, letters, and films to bring the historical accuracy, but the pacing is sharp and constantly moving forward. There's no lagging moments in the film as you're engaged right to the end to see what happens to these characters. Also, it must be pointed out that the set pieces, costumes, airplanes, and such are all vivid and real with no CGI in sight. That is always appreciated. Regardless of what one might think of Tom Cruise and his public antics in recent years, it can't be denied that he is a talented actor and can still bring it with intensity when the camera rolls. He (and the character) is the central point to which the movie will either win or fail, and it's a total win. We follow Stauffenberg through the movie as he takes charge of the plan and relentlessly keeps driving it forward as one obstacle after another comes up. We realize the terrible consequences that await for him and his family and everyone involved should the plan fail and yet believe in his strength of conviction when he says they must show the world not everyone in Germany held Hitler's beliefs. However, anyone who has opened a history book will know Hitler's fate, but that never takes away from the riveting drama played out in this story. I was surprised to see the theatre packed full when we went, and as we discussed it after, there were probably teenagers there looking for a Tom Cruise adventure movie not realizing the important slice of history they were about to see up on the screen. I often think that today's instant gratification generation could not begin to come up with the inner fortitude to fight the battles faced by our ancestors in the past and any chance to show and possibly even learn from what's come before is a welcome opportunity, even if it's packaged in a Hollywood thriller. This is one of the better movies I've seen in a while and one that stays with you as you mentally play out character decisions and "what if" moments of history. I hope more people go to see it as it's an actual rare movie that's worth the trip to the local cineplex. Comments on "Me Mini Movie Reviews: Valkyrie"